Sometimes an Elvis import CD comes along that really surprises you. Knowing that this was ‘just another’ audience recording, and already being familiar with Elvis’ live version of ‘Pieces Of My Life’, I wasn’t expecting anything out of the ordinary – but this is great! Being the last concert of the tour and with Elvis trying to impress the somewhat subdued Ashville audience, Elvis is astonishingly good. He throws in request after request and sings his heart out. Live in Asheville July 24, 1975. Closing Show. The last three concerts of Elvis’ July 1975 tour were in Asheville. Elvis had to work extra hard to get his usual response from the audience and they were all memorable shows. For some reason the 8000 strong crowd didn’t react with standing ovations and despite the exciting atmousphere they were somewhat reserved. Elvis even commented, "I don't know who's asked you to stay in your seats. It's not me!" It became a challenge for him to electrify the crowd and Elvis always responded to challenges. The penultimate concert of the tour has been featured on the very good import 'Gyrating Asheville' which includes Elvis’ fabulous comment, "I'm not getting better, I'm gettin' older!" For his very last concert of the tour, in an inspired move, Elvis asked for a ‘Request Box’ to be placed in the lobby so that the fans could suggest their favourite songs. A few days earlier Elvis on-stage had said some unpleasant things to both Kathy Westmoreland & the Sweet Inspirations and, feeling guilty, it was also in Ashville that Elvis tried to make amends. He flew in his Memphis jeweler, Lowell Hayes, and Elvis bought a small fortune in jewels & rings as presents. He apologised to the Sweet Inspirations for his behaviour giving them each a $5,000 ring. While Elvis was still seeing his girlfriend Linda Thompson, he was also seeing another beauty queen Melissa Blackwood. Whatever the explanation or inspiration, Elvis was in fabulous form for the final show of this tour on July 24th 1975 in Ashville, even throwing two of his diamond rings into the crowd. Elvis kicks off with a fast & furious ‘That’s All Right’ and there is a real excitement with the screams of the crowd pushing him along. Elvis deviates from the regular ‘See See Rider’ start & whether the crowd realise it or not, they sure sound responsive here! There is a cute, deliberate, false start to ‘I Got A Woman’ & Elvis mentions moving around to imitate a revolving stage. Elvis pushes ‘Amen’ ending to a fabulous close and this time without overdoing the usual J.D reprise. Elvis pushes straight into an enthusiastic ‘Big Boss Man’ & follows up teasing the crowd & suggesting to a fan who wants a kiss, "I never know if you want me to kiss you, . . maybe I’m going to lay it on you!" Elvis keeps up the fast pace for ‘If You Love Me’, ‘All Shook Up’ and his usual selection of crowd pleasers before the real treats start. At this point (nine songs in!) Elvis says, "Welcome to the show. We’re off to a good start, and we happen to be in a good mood! I don’t know if they asked you for requests or not – Did they? (audience screams) – So we’re going to do a whole bunch of songs for you." Then seven more audience requests follow! ‘Heartbreak Hotel’ is very cool and the energetic & unrehearsed ‘Jailhouse Rock’ that follows surprises the band as much as it does Elvis as he fluffs the lyrics noting, "They were dancing... you fool. . " and at the end, "It’s been many years since we’ve done that". Without a break Elvis selects the request ‘Something’ as his next song - and this would be the last time he would ever sing I live. Elvis sings it nice and slow with an obviously very rich voice compared to a few years earlier. He forgets a few words but the response is fabulous and the spontaneity adds an interesting edge. Shockingly it takes just 5 seconds for Elvis to decide to do ‘Return To Sender’ as his next request! "What’s that, Return To Sender? Oh Lord, have mercy on us!" (Boy the band must have been thinking on their feet that night!). Elvis tries out the first line a few times saying, "I gotta find the key first!.. a door key!" Despite the roughness & forgotten lyrics it is a sensational treat for the crowd with Elvis’ own enthusiasm & laughter showing through. "Whoo" he adds as the crowd explodes, "A lovely song we haven’t done in years, so please forgive us." This is followed by a request for ‘Wooden Heart’! Without taped proof you could hardly believe these selections as real! Elvis considers a request for ‘Suspicious Minds’ but goes for ‘Hawaiian Wedding Song’ instead. A cute version as always with Elvis adding a reprise. ‘Bridge Over Troubled Water’ is another request and as good as ever with Elvis showing off his passion & power to the now enthusiastic crowd. Remember that this is an audience recording with nothing like the clarity of ‘Dixeland Rocks’. ‘Polk Salad Annie’ has Elvis pulling out all the stops. Elvis rocks through it throwing in some impressive karate action before taking a break with the band introductions. This night Elvis introduces everybody nicely without any off-hand remarks having obviously made up with the group. He enthusiastically joins in ‘Hail Hail Rock n’ Roll’ and pushes James Burton’s ‘Johnny B Goode’ along. Elvis is working hard and without the usual intro he pushes straight into "his latest record" and a fine ‘T.R.O.U.B.L.E’ with a fabulously extended & enthusiastic ending (but sadly without the unique ‘Trouble’ of the recent FTD ‘Southern Nights’). During this tour Elvis was unusually focused on promoting his new album. Or was he just enjoying singing some new songs from what would be his final studio LP? So next was the rare ‘Shake A Hand’ and Elvis delivers it with great style & cleverly plays to the crowd. He laughs, forgets a line and cutely sings at one point, "…Ha Ha. .whatever the next line is!" The band is obviously enjoying playing something different and it has a lovely gospel feel that works really well being played to a crowd. With the audience reaction it definitely has a better edge over the studio version. Elvis introduces Vernon to a rapturous crowd explaining that he has been sick saying that he is going to sing Vernon’s favourite song from his last LP. 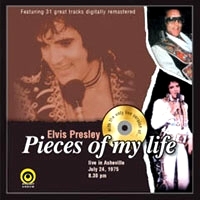 ‘Pieces Of My Life’ is the real treat here, Elvis’ only live performance and it’s surprising that he remembers the lyrics so well having recorded it 4 months previously. Having presented it as his Father’s favourite it’s a nice touch that to the line ‘Women that I never knew too well’, Elvis jokingly adds the comment "I wonder why this is your favourite song, Daddy!" It’s a touching version and of course feels even more important being the last song that Elvis would record in a professional studio. For such an unknown song the audience is amazingly quiet as they absorb the song’s sentiment & the sincere ending. . If only they knew the future. Elvis wants to leave the crowd with a blistering finale so follows with a powerful & sincere ‘How Great Thou Art’ along with a formidable reprise. The audience goes wild and Elvis knows that Ashville will certainly never forget this night. His gratitude to crowd is heartfelt as he says, "Thank you very much, you’re fantastic. Thank you, I appreciate it. Thank you very much. Whoo". And with a, "May God Bless you & be careful driving home" ‘Can’t Help Falling In Love’ wraps it up. Verdict.- While this is of course, disappointingly, only an audience recording there was a real slice of pure Elvis magic captured that night in Ashville. Of course FTD’s 1975 concert releases present the "regular songs" in much better quality audio (Huntsville’s opening shows were yet more blistering performances). However Elvis’ idea of the request box worked perfectly here, as well as his own desire to include input from his new LP. Elvis as always rose to the challenge, conquering Asheville and performing one of his best ever concerts of his last 2 years. All we need now is for Ernst & FTD to find the reel-to-reel soundboard. Note - EIN does not support bootleggers since they do deprive songwriters & musicians of their well-deserved earnings, but the hope is that something like this will inspire FTD to consider a similar release. Click here for an in-depth look at Straight Arrow's release on Elvis' reputed "worst concert" at College Park 1974. 'Chaos In College Park'.